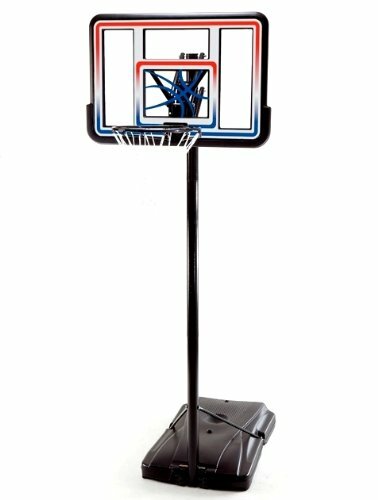 Competitive Edge Products is happy to offer the famous Lifetime 1533 Portable Basketball Hoop with 44 Inch Acrylic Backboard. The Courtside Portable Basketball Hoop from Lifetime has a 31-gallon heavy-duty portable base that rolls to your desired location and is filled with sand or water for stability. No concrete installation required! This portable hoop also is designed with 6 adjustable height settings so the whole family can get in on the game, wherever you want to play hoops. This portable basketball system from Lifetime Products features a 44" Shatter-Proof Makrolon® backboard with a Quick Adjust® II height adjustment mechanism that adjusts from 8 to 10 feet high. It also includes a Classic Rim with an all-weather nylon net and a 3" diameter round steel pole. With a 31-gallon portable base, this system can easily be moved to a desired location. So bring the arena to your home with a residential basketball system from Lifetime Products. This Lifetime Acrylic Portable Basketball System features a 44in acrylic backboard for a pro-glass look. Just fill the 31 gal. portable base with sand or water to provide exceptional stability. The Quick Adjust II height adjustment feature allows you to adjust the height to six different settings. Youll appreciate the convenience of a relocating your basketball system whenever and wherever you like. Lifetimes acrylic portable system is built with top-quality construction and design. The acrylic playing surface offers superior strength and UV-protected fade-resistant graphics. The steel pole structure is powder-coated to resist rusting and weather erosion. So get off the couch and out of the house with this durable and attractive basketball hoop.